Just eight days before Hana Leigh was born, Clee learned the Calm Birth meditation technique and had a powerful, calm, connected, sunrise birth. Late in her third pregnancy, Clee expressed interest in meditation to a midwife she had just chosen to help her with her birth, which she wanted to be completely natural. The midwife had heard of Calm Birth and recommended that Clee get in touch with the program. The result was that even though Clee received the Womb Breathing and Practice of Opening instructions only eight days before the birth, the following account testifies that even if a woman is introduced to Calm Birth meditation toward the end of the pregnancy, the practice can be transformative. 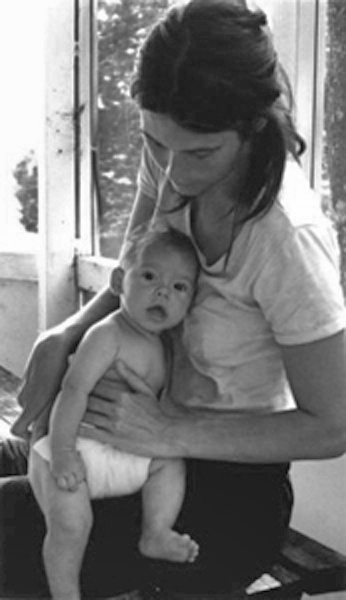 CB (interviewer, Whitney Wolf): Hana Leigh was born eight days after you were introduced to the Calm Birth methods. What were your first experiences, once you received the Calm Birth instructions? Clee: Just taking the time to sit, to be centered, and go inward, and to check in. That quiet space. It really helped a lot. CB: How did you find taking that inward space helpful at that point in your pregnancy? Clee: It helped to reduce stress and clarify some things within myself. It provided me a calm space. It definitely helped me to calm down and feel more centered and balanced, and ready to deal with the next day, with my other children, and all the input and stimulation of the day. CB: How would you describe your experience of the meditation? Clee: Definitely a sense of being more centered, calm, and present. I was able to stay that way even with a lot of things that were going on. During the birth I was able to be in the present moment, with the pain, not wondering what it would be in an hour from now, or going away from the moment. It really helped me to be fully in the birth experience. CB: Austen, did you have any kind of experience where you could imagine the womb in yourself with the child in your womb? Austen: Yes, definitely. I had a couple of dreams that were very lucid where I felt that I was pregnant and I could feel Hana Leigh was really active in my belly. She was moving around. Actually, I think what happened is that I fell asleep with my hand on Clee’s belly and she was moving all around when I fell into a dream space with that happening. And then I had this dream that she was in my tummy moving all around and I think that in the real space my hand was still on Clee’s belly. I remember doing the breath meditation and I felt a sense of warm energy in my tummy. The sense of breathing to nourish your baby felt really good and I could connect with that. The Womb Breathing actually helped me to remember to breathe to nourish my own inner baby. It was great. Clee: Yes, it was nice to share that experience together. CB: By having the Calm Birth meditation, how did this pregnancy differ from your previous pregnancies? Clee: This time in the actual labor I was able to be more in the moment, breathing and opening up to that pain, not resisting it as I had done before. I attribute that to a lot of things, but it helped me by listening to the CD and practicing, being more aware and in the moment and more able to open up to that pain rather than resisting it. CB: How did the meditation help you with the pain? Clee: Being present with the pain and not resisting it was amazing. It was the most powerful, wonderful experience. It was a journey and a great adventure rather than a scary drawn out nightmare. CB: The pain and the fear appear to be connected. If you resist the pain it leads to more fear. If you surrender and open, the fear and resistance seem to resolve themselves. Clee: Exactly. Because being in the moment you are just being there, fully feeling. You are open and just there. Fear for me comes when you’re worrying what is going to happen, the next contraction, or when the baby comes, grasping for a moment that isn’t real. Then you are missing out on being in the moment, not being able to be open, because you are resisting something that has not even happened. It is kind of hard to explain. I would say that the pain didn’t feel as painful because the breathing meditation stayed with me. CB: Austen, as soon as Clee brought the CD home you started practicing with her. How did that affect you? Austen: It definitely helped me with a sense of connection. It helped shift me into a balanced perspective. Whereas before, being a father in a pregnancy you are feeling a sense of more like ‘I am going to take care of the other duties. I am not really in charge of nourishing the baby in the body besides cooking meals for the mama.’ It reminded me, it might have been something that I read or heard on the Calm Birth CD, that the father is important, spiritually and energetically nourishing the baby with his thoughts and energy. So there is a real connection. It definitely helped me to see that… After receiving the meditation and before she was born, it was really rich with magical experiences. Probably dreams too, but it’s hard to remember. Clee: That’s because it was like a kind of dreamy space around the birth. Austen: We talked about it being only a week and three days that we had the CD, but when Clee first heard from Rhione, the midwife, about this opportunity, that someone was writing a book and was offering classes and the CD, that was sort of like the initial connection. That was the first time I’d really heard of anything about pregnant woman or couples meditating to alleviate the fears and discomforts in labor. I’d never heard anything about that. that was a couple of weeks prior to when Clee met you and received the practices. Clee: The day before the birth I came outside and hung out. We had a beautiful, wonderful day. I was having light cramping. Went to bed that night and woke up about 3:00 in the morning. What I recall is Anaya [two year old son] screaming “baby” in the middle of the night and waking me up. That is what I recall. I recall him saying “BABY” and I was in labor! It was pretty amazing. And I woke up and said, “I’m in labor”… Then I said that I was cold so we made the house really warm. I asked Austen to time the contractions. I thought the baby was going to come relatively quickly. So, I was really able to be present, to really open up to the pain. CB: I know that when we first met, when we first instructed you in the practice, you shared with me that you wanted to really come to a place where you could open and surrender. Clee: That was my big hope for my experience with labor and I was really able to do that and it was so great. I was able to go through labor by myself for a while, until the midwives arrived. They got here just as the sun was rising. Austen: They got here right when the light was coming in. It was amazing. They had just walked in, we had had some worries that Anaya and Kai’ [their sons] would be upset and be awake and want lots of attention. But they were sound asleep and they slept through the majority of it. Clee: Anaya woke up about an hour before the birth… I went on amazing journeys. I just went into myself and it was like I was feeling myself like you were talking about in the meditation CD, how you can get way out there and the voice brings me back, I was able to bring myself back. I would get real involved in the pain and then I would feel okay. Then I would imagine whales under water giving birth and I would think, wow, you know, I can do this. And then I thought about all of the women that were giving birth in that moment and all those who have given birth. I was really able to ground myself in these real feelings of power and the beauty of it, rather than feeling I can’t do this because it’s such a hard thing. ‘I am doing this! There are hundreds of women doing this right now. I can do this! I am doing it!’ …The midwives came in and we were sitting there. I was able to let them touch my body and open up to their love, and the same with Austen, without feeling resistance. Then the contractions started getting really strong and the pain was getting more and more difficult for me to handle. I said that I wanted to get into the water and I did. Not too long after I got in the water, maybe an hour, she was born. Austen: Just as the sun was rising – I remember them saying, “Oh, I see her head,” and I was holding Anaya [2-year old son] and walking around. Maybe it was ten minutes before she was born that the sun peaked—there is a ridge on the east side, and there was this glimmer of sun peaking over that ridge. Austen: Yes. I’ve heard these sounds in songs before in Tibetan chants sung by monks that are real deep. That’s what she sounded like when she was in the water. CB: Have you ever experienced these sounds in yourself before? Clee: Not in myself. No. It felt so good. I felt so grounded and rooted in strength, like, ah—the earth. I really don’t have words for it, but it really helped me. It was a tool for using my voice like I had been wanting to do in my previous births, without screaming or distress. CB: Were you aware of your breathing during the contractions, or in delivery, by returning to Womb Breathing? Clee: Oh yes. I was very conscious of my breath throughout, the whole way. While I was going on a journey inside myself, the breath was the physical manifestation of the other part that was helping me remain open. Helping me to be flexible and open. It was the breath. CB: When the contractions relaxed did you find yourself doing the Womb Breathing? Clee: Yes. Right in between while I was awaiting the next contraction and I was taking time to breathe and center myself. Austen: And she was subconsciously doing Womb Breathing. Her body reverted to that naturally. Clee: Definitely. Yes. It was really great. It was beautiful. It was wonderful. It went really smoothly. It was really calm. She came out and she was just sitting there and I rubbed her back and it was really peaceful space for her to come into. Everything had been peaceful. Austen: The midwives commented that it was hard for them to leave this house. CB: How was it hard for them to leave? Austen: Because it was being in life itself. Sometimes, you know, the labor gets intense and people are all involved and there is lots of tension and the woman is in a lot of pain rather than letting it just flow. Clee was really able to handle the intensity of energy [Clee comments with “yes”], to be able to handle it and harness it rather than fight it because it is literally like the universe pouring through the mother giving birth. That energy is coming through. Clee let the energy flow rather than be afraid of it. At one point one of the midwives commented that she has been doing childbirth for a long time and it was a great day for other women across the world giving birth because they could tap into that energy that Clee was experiencing. Clee: Every step of the way, the first thing I would do was check in with her [Hana Leigh] and recognize that this pain is bringing my baby closer to me. I don’t know other than I was just opening up to her coming through. It was like I was in a process of birth. I felt like that is how I had to prepare myself to be her mother and to know her. CB: Was there a need to push? Clee: I did go through a little bit of wanting to bear down and push as hard as I could, and I did that: push, push, push. It was really hard. Then the attending midwifes reminded me saying, “Open yourself up and allow the baby to come through and be with your breath.” Then I was able to let her come through more naturally rather than trying to push. I experienced both sides of what you are saying: feeling the desire to get the pain over with, and the releasing through my breath. CB: What do you feel was the urge to want to push? Clee: I was ready for her to come out. ‘I want to see you now, you’re so close.’ And then wanting to be in control of it, wanting to be active in it rather than opening up and being responsible with this energy. Austen: Yeah, wanting to have a sense of control. CB: What was the difference when you were pushing versus when you felt that you were being moved? Clee: When I was trying to push, there was a sense of forceful energy trying to get something out. She was resisting it. CB: How did you know that? Clee: It was a feeling that she would come down and slip back up and I could feel her doing it. There was a sense of trying to make something happen while not really knowing if it’s not going to happen. If you just keep pushing, pushing, pushing, pushing, it’s resistance. CB: Would you say that the Calm Birth meditation was helpful for you to listen to your instincts? Clee: Yes, definitely. I can imagine had I implemented it much earlier it could have been even more helpful. Taking the time to do that for myself, to listen to the CD and do the practice. That’s a key. I think women would really benefit from that, taking the time and space to breathe and go within. CB: Do you feel that you accomplished what your intention was when we first met when you expressed to me what your concerns were and what you wanted to accomplish with this labor and delivery with Hana Leigh? Clee: Oh yes. I was definitely able to do what I wanted to, which was to open up and allow the universe of life to be poured through me and be able to embrace it and enjoy it and see it as a real gift. When you fully open up to it, it’s this amazing, strong, powerful love flowing through you! It’s really an amazing gift! CB: I can feel it right now with you voicing it, the power went right through me, the power again, how beautiful. Clee: It is and I feel blessed to have been able to get to a space to feel it, instead of resisting it and being afraid of it because it is really powerful.